Good News For the Police and the Public. smart is different. That’s reflected in the way the name is spelled with a lower case ‘s’. Good news for the relationship between the police and the public. It comes via an ever more popular car, smart. 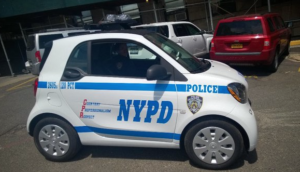 As you may know, the NYPD drive smart cars. 250 Went into service in 2016. 29 more are on order. For Manhattan, what could be better. Size alone gives police officers newfound agility and convenience. If only the US Treasury Department minted something smaller than a dime. That way you could describe the coin smart can turn on. Maneuverability is akin to a blob of mercury you can pour through the tightest angles. And the design deserves hurrahs. At the heart of the car is a steel cage that’s a wonder of engineering when it comes to protecting occupants. Life-saving stories abound. We have Mercedes-Benz to thank for all this. smart is their baby. Oddly enough Mercedes-Benz parentage doesn’t seem to be common knowledge in the States. Yes, we’re praising smart to the skies, but maybe its greatest advantage has been wholly unexpected. Somehow as smart drivers the cops seem friendlier and approachable. Overnight, law enforcement has become more sensitive than brutal. Remarkably, the public have developed something of an affection for the police thanks to the smart image. More to that, it has prompted dialogue between the law and the public. Suddenly you have cooperation and understanding. There’s a turn up for the books. When presented with a $115 fine for double parking, a new respect for the cops might even get you to say ‘thank you very much, sir’. It’s said the car you drive says a lot about you. It proves it to the point law enforcement agencies nationwide might want to take a lesson from the NYPD and buy smart cars. How smart would that be. What’s Better Than An Advertising Award? 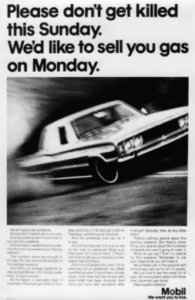 In the 1960s Doyle Dane Bernbach had the Mobil Oil account. Their ads didn’t read like ads. They read like public service announcements. Nothing in the category had ever reflected public interest so strongly. The long copy convinced you the company wanted to be a guardian for your safety. People liked that. So the ads were read and read. The art director, Len Sirowitz, said the newspapers called the agency with a request. The ads were so good, they explained, they wanted to run them for free. Sounds better than an advertising award, doesn’t it? Kick Yourself If You Miss This Exhibit. 1938 Talbot-Lago T150C-SS Teardrop. It’s from the ‘Rolling Sculpture, Art Deco Cars From The 1930s and ‘40s’ exhibit at the North Carolina Museum of Art in Raleigh. Built by the French company, Automobiles Talbot SA. Yes, boot yourself more than once if you can’t get to North Carolina in the next few weeks — up until January 15th. 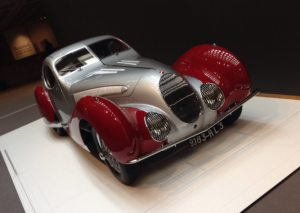 Stunning Art Deco motor cars await you in Raleigh’s North Carolina Museum of Art. Fourteen shining examples, in fact, along with three motorcycles. ‘Rolling Sculpture, Art Deco Cars From The 1930s and ‘40s’ … that’s how this show is titled. Go along and you’ll understand that gasping with appreciation isn’t discouraged. We heard more than a few people audibly catch their breath. It’s that good. Uncontained enthusiasm brought total strangers together to discuss the merits of the cars, streamline design and the crying shame that the era for these beauties has passed. More than iPhone photography, Edsel Ford’s 1934 Model 40 Speedster had the Nikon brigade snapping shots from every angle. A serious attempt to capture all the art represents. At shoelace level one enthusiast lay on the floor to capture a dramatic view of the 1938 Hispano-Suiza H6B ‘Xenia’. Another was on both knees to shoot the 1933 Pierce-Arrow. Silver Arrow model. Pictured above is a 1938 Talbot-Lago T150C-SS Teardrop. Stunning only begins to describe it. Ten years back a T150C-SS Teardrop sold at auction for $3,905,000. Note the rich, earthy red color that completes a two-tone presentation. 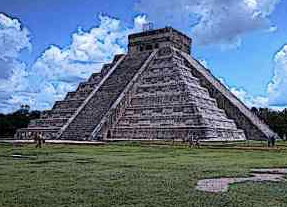 We’re thinking it might have been inspired by the ancient Egyptians. Reason for that lies with Howard Carter’s 1922 discovery of the intact tomb of Tutankhamun. On the heels of the King Tut find ancient Egyptian art electrified the world. It dominated the jazz age and carried on to the 30s and 40s. Art Deco, in everything from jewelry to motor cars and skyscrapers like the Chrysler Building, was heavily influenced. The famous Tutankhamun death mask features geometric lines with the earthy red color you see on the Talbot-Lago. More than that it’s a color that runs through Egyptian art. Was there a chance the head of Automobiles Talbot SA, Antonio Lago, was swayed by Howard Carter’s discoveries? Many of his cars feature that earthy red. Well … you finish the sentence with your own superlatives after you see the show. 3500 Kilometers of racing in a space of three weeks with almost 200 riders. That’s the Tour de France. Strange as it may seem the rider who finishes last wins a kind of notoriety. He’s awarded the title of the Red Lantern, which refers to the lights on the last car of a train. It’s kudos for a heroic failure. Another heroic failure is Eddie the Eagle. Michael ‘Eddie’ Edwards to be exact. As you may know, he represented Britain in ski jumping in the 1988 Olympics. Untrained and with no skills for flying like an eagle, Eddie often bumbled down the ski jump track to land at the end with a splat. In spite of finishing miles behind the other jumpers he became a celebrity. Credit that to the fact that while he had no talent, he had pluck. Tons of it. On to poetry and The Great McGonagall, as William Topaz McGonagall was known. He aspired to be Poet Laurate of Great Britain. His dedication to the art of poetry was immense but he was hopeless as a writer. Bad only begins to describe his verse. The title, The Great McGonagall, was ironic. A glaring contradiction. As a poet he was judged to be the worst ever. Because many of them are thirteen storeys high. Call it doggerel; these lines consign McGonagall to the heroic failure category. One more heroic failure … or a possible one. With drinks after work recently some of us felt ad agencies could become the next heroic failures. Certainly the agency-client relationship isn’t what it once was. While agency CEOs aspire to be invaluable to their clients, Facebook, Google and Apple appear to be eating their dinners. Madison Avenue could be losing ground to Silicon Valley. As a result a number of creative people have already jumped ship from agencies to work for companies like Apple and Samsung. Our group decided it might be smart to send a resume along to Jonathan Ive, Apple’s driving force for creativity and design. It could turn out to be a career-saving move. A move that could save agency creatives ending up in a splat. Why Should There Be a Divide Between Marketing and IT? It’s hard to sneak up on a Zebra. He’ll hear you and run. Zebras. Their hearing is sharp. It’s highly acute to warn against approaching animals or people. Giraffes. Necks that go up and up forever lead to long-range vision to detect trouble before it can get dangerously close. 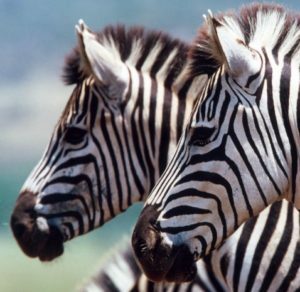 Zebras and giraffes are wholly different but they often herd together. It’s thought they cooperate to guard against being attacked and eaten by lions. One group acts as an alarm system for the other. Read about this in On Trails by Robert Moor. Your interest will be rewarded on every page. On the subject of cooperation (and its opposite), in more than a few companies we’ve worked with there are two different animals. You don’t need me to tell you they come from dissimilar worlds. They think differently, they’re educated differently, their goals are unalike and they often exist in silos. Actually, at times those silos can be more accurately described as fiefdoms. Instead of working to advance the overall performance of a company, Marketing and IT often compete. Who’s more effective, who’s more valuable … those questions underlie battles for supremacy. To hell with the overall progress of the organization. It’s estimated billions are lost with strife and inefficiency that kills communication. Could education be the answer? Maybe marketers need to become geekier. Maybe they should hit the books and benefit with tech learning. Justly, maybe IT needs to read into the wee hours, as well. Maybe they can learn more about brands, product differentiation and ways to create the moment someone buys. Let’s hope there’s a way for marketing and IT to come together to ditch the silos and support one another. Because failing to do that opens the door for one thing. Competitors who pounce like hungry lions. Drinks after work are revealing when it comes to personal opinions. Recently we heard complaints about both young and older people ad agencies. That got an affirmative nod. ‘Yeah, tell me about it’, one guy said. He’s fairly young himself, but successful. Then seniors were in the crosshairs. Energetic, open-minded, risk-taking, provocative — not! A bit harsh, of course, but maybe it was the Jack Daniels talking. In any case, someone said it’s no wonder clients are unhappy with agencies and business is shifting to consultants. The thing is, why complain if you don’t have a solution. It’s just ear bashing. So, how about better training programs? They’re bound to help young art directors, writers and account people. Agencies could invest more in courses to bring staff further along. But what about seniors, those who could be well set in there ways and not exactly open to change. The imperative could be ‘remake yourself, make a clean, new start’. 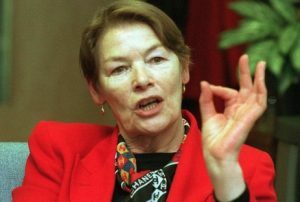 It’s easier said then done, but a model for that is Glenda Jackson. The great actress is coming out of retirement to play King Lear in an Old Vic production. A woman in the King Lear role is intriguing as a re-imagination of Shakespeare. But gender swapping is not unheard of in Shakespeare productions. And in the role they’ve come across as virile, manly and tough. Especially Sarah Bernhardt who played the role in Paris and London in 1899. We’re wondering if a man could play Joan of Arc as well in George Bernard Shaw’s play Saint Joan. Chances are you know Glenda Jackson’s work. Academy Awards for Best Actress, Emmy Awards … the list of her abilities is as long as your arm. But imagine giving all that up to follow your political convictions. She retired from acting to stand for election to the House of Commons in 1992. She became Labour MP for Hampstead and Highgate, served as a shadow minister and was appointed as parliamentary under secretary of state by Tony Blair. No doubt we’re forgetting half a hundred other accomplishments including railing against Margaret Thatcher’s policies in order to redress the problems of unemployment. Now Glenda Jackson is back. She opens as King Lear on October 25th. For those in decline, here’s a thought. The Old Vic box office is open. So fly to London. It’s bound to be inspiring, motivating and more to head for the Old Vic to see Glenda Jackson stage. She’s a living example that you don’t have to be in decline and s%!t past 50. Did we 50? Glenda Jackson is more like 80. Do It The Way I Picture You Doing It. You might say Volvo ads these days are at the exhilarating end of cheerless. At best they’re just okay. 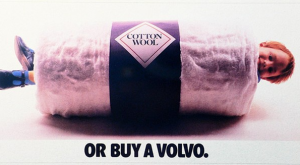 But in the past the ad above and other Volvo work set creative standards for automotive as well as all product areas. There’s a loaded expression for you, Do It The Way I Picture You Doing It. It’s how some marketers direct the creative work of their agencies. Anything counter to their thinking hits a snag. With inflexible beliefs or inexperience, any chance of progress is squashed. It’s not exactly a great recipe for creativity, is it, when you start with preconceptions and boundaries. We were wondering about this when it comes to Volvo. The company is going from strength to strength with their cars. The new S90 sedan is a wonder of automotive thinking according to car reviewers. The V90 wagon, soon to be introduced, should put the German manufacturers on notice when it comes to excellence. Volvo has come a long way. But it looks like the opposite is true for Volvo advertising. Many say it’s become ordinary. So what’s happened to Volvo’s ability to do great ads? 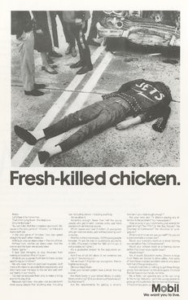 Not too long ago they excelled not just in the automotive category but they stood as examples of how good advertising can be. What’s holding Volvo back, is it the Do It The Way I Picture You Doing It thing? Or is it the agency? Maybe Volvo engineers should have a say in the ads. That way the work could become as good as the cars they build. The Shaming of the Civilized World. Here, four gas chambers put 6000 people to death each day. As a Holocaust survivor Elie Wiesel started the Elie Wiesel Foundation for Humanity and won the Nobel Prize. The most important moral voice of our time. That’s how world leaders saw him. It’s evident in the tattooed number the Nazis put on Elie Wiesel’s forearm in Buchenwald. Nelson Mandela had a number as well. A penitentiary number. A government dehumanized him as 46664, locking him away for 27 years. You know how the 46664 story turned out, of course. Prisoner to President. It’s a tribute to rights and justice. Lesser known may be Wiesel who passed away yesterday (2 July) at 87. He survived the Holocaust to write Night. A 127-page book about death in the concentration camps. Smoke from the chimneys carried away the innocent faces of children. That’s his image, his memory. At 127 pages Night is short but terrifying. It’s hardly bearable. Many agree that it’s good that it’s alarming. Still, Wiesel left us a message about that. He said, ‘Because I remember I despair … because I remember I have the duty to reject despair’. There’s an abiding faith in humanism and the future in that. Optimism … even after wreathes of smoke spilled from the chimney tops. Maybe that’s why Jimmy Carter, Ronald Reagan and Barack Obama looked to him for inspiration. Many will now read and re-read Night. Many of the unborn will come to read it as well.